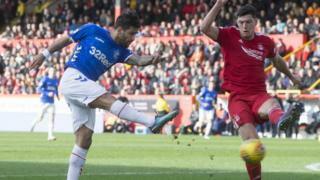 Six people have been arrested in connection with disorder and the use of a pyrotechnic device during the Aberdeen v Rangers game at Pittodrie. Police said five men and a woman were arrested at the game, which ended in a 1-1 draw. Meanwhile, Aberdeen will send Rangers a bill for seats damaged at Pittodrie following the Scottish Cup quarter-final. More than 80 seats were broken in the away section, 60 of which were beyond repair and will cost £45 each to replace, with the total estimated damage about £3,000. The sides will contest a replay at Ibrox on Tuesday 12 March.